Everyone loves brownies or at least everyone that I know. There is something about that rich, chocolate-y, fudge-y taste. 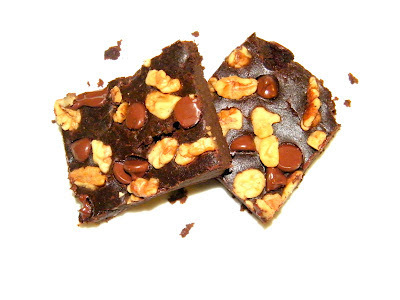 Most brownies are about 400+ calories per serving, loaded with unhealthy fats and are carb rich most of the time. For a while, I have been wanting to try black bean brownies but I was skeptical that they would actually taste good. After looking through several recipes, I decided to make my own batch. While making them and smelling the aroma while they baked in the oven, the house smelled delicious! However, I was still a scared-y cat to try them once they were finished… needed to see someone else eat them first. My kids tried them and loved them! My hubby tried one and he said “aren’t you going to try one?” I did after hesitating for a couple seconds and they truly are good, not GREAT like the bad brownies we’re used to but they would definitely satisfy a chocolate craving. After my husband and I ate ours, we discussed ways to make them have a more traditional feel/taste toward them and decided that adding a gluten free flour and chopped up walnuts into the batter would make them even more tasty! If you’re like me, you just have to get over the weirdness of it! Stephanie’s note: I can attest to the fact that these brownies are GOOD! Are you looking for other healthy treat ideas for this Valentine’s Day, or just to replace conventional treats in general? Check out the recipe eBooks Smart Sweets and Treat Yourself: Real Food Desserts. Both are full of delicious sweet recipes, made with whole, unrefined ingredients. Have you ever made a dessert with non-traditional ingredients? Caroline, I love being sneaky with recipes too! 😉 I hope you LOVE them! I’ve made these too! I had to see for myself if they really were any good. My family almost didn’t believe me when I told them what was in them. These are a must-try! Kristin, family is the worst about believing anything healthy or health-related at least for us and I must say I was weary too but they are great! Gonna try this! If I can make a zucchini pie that tastes just like apple I am sure I can make black beans brownies that taste yummy! Thanks for sharing! I want this recipe for a zucchini pie that tastes like apple! Sounds delicious! That reminds me of the Little House on the Prairies book where Ma Ingalls makes a pie that tastes like apple pie, but she does it with unripe pumpkin! Jeana, how were they? I need to order sucanat in buck, it’s expensive per pound! Where do you order it? 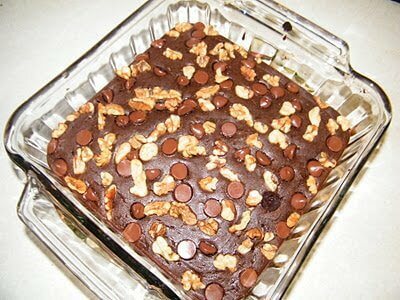 My little girls LOVE black bean brownies, and your recipe looks delicious, Rachel! I can’t wait to try it! Erin, my kids love them too! Let me know what you think when you try these! They look decadent. 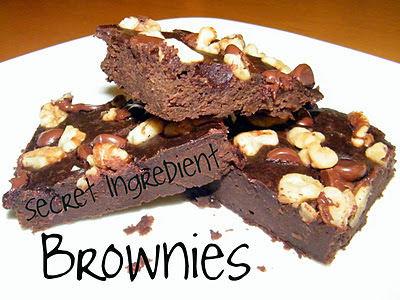 Just curious did you add flour to the brownies pictured? Thanks Lisa, in these pictures I did not add the flour. Are you going to try it with the flour? My three youngest children and I made these today for the older ones. We didn’t tell them what the secret ingredient was until after they ate them. They were delicious! We will be making them again. Thank you for sharing the recipe. That is great Elisabeth! What did your older kids think? I have a recipe for black bean brownies, but I haven’t tried them yet. I have made chocolate chip cookies with chick peas in them though. They were tasty! Yum Grace, do you have the recipe you used? I just saw a similar recipe in “Living Without” and was pretty weirded out, but I think you’re tempting me right over the edge. Especially because, wonder of wonders, I think I actually have all those ingredients on hand right now! Hannah, what did you and your little chefs think about the brownies? In my mother’s days, it was zuchinni bread, and eggless chocolate cake. My trick to get vegies into kids was to blenderize onions and peppers into the spagetti sauce. 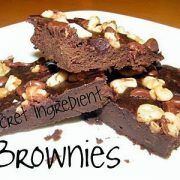 I can’t wait to try these brownies! Michelle, love sneaking healthy foods in too! I love chucky spaghetti but for the kids that is a great idea! How’s yours taste? Awesome. I’ve seen a similar recipe but didn’t realize the flour is optional. I will try these for Valentine’s Day. Plus, I’m trying to get in more protein since I’m pregnant and these have to have more protein than regular brownies. Thanks for sharing. Shannon, congrats on the little one coming soon! Yes, getting more protein while pregnant is important! Let me know how yours turn out tomorrow! I was the same way I when I first started making black bean brownies! 🙂 I was so scared, I totally fed them to people who didn’t see it coming. They loved them but it was hard for me to not think that I was eating sweet refried beans. Add chocolate chips and walnuts helped a lot. Great idea about adding a little flour. To make these treats even healthier – no cholesteol – replace the eggs with 3/4 cup unsweetened applesauce. They are very good! That is a great idea and suggestion, however, I don’t particularly think eggs are bad for you. I think they are part of a balanced diet. I have though, added eggs in place of fats (once in a while) to breads or baked desserts. I’ve made a version of these brownies, and this recipe looks even better, but I’m quite surprised to see the Nestle in the photo. There are lots of alternative brands for cocoa that aren’t made by Nestle. If you google Nestle Boycott you can find lots of information about their highly unethical marketing of infant formula, particularly in the third world where water used to mix formula may not always be safe for infants. Sarah, I totally understand the controversy and never used formula but have heard about it. A family member bought that particular cocoa to make something here once and just used what I had left for this recipe, when I buy my own I don’t use that kind. Thanks for your concerned comment! I don’t have any coconut oil… is there something else I could use instead? Also, what is substitute for sucanat? Sugar? Sara, yes, you could use unsalted butter, grapeseed oil or even olive oil. And you can use sugar as a substitute for sucanant! Let me know how yours turn out! This is such a great idea I’m making some tomorrow! I’m so thrilled I found this blog. Apart from being tasty, this must have a great (low) GI, high fiber and high protein rating. Plus being high in antioxidants from all that raw cacao in your organic chocolate. Hey Suzi, are you the same Suzi from above comment? Anyhow, Hello from Australia, Keeper of the Home is a great website full of awesome natural living posts! How did your brownies turn out? Yes that’s me.. commented twice. Yes, I made the brownies today and … well… er… I think I’ll tweak it and try again. It reminded me of a sweet bean filled bun from the Chinese grocer. I’ll report back with take two (if it’s good!). Hey I’m sure you could even add 3/4 cup cooked down dates to this recipe as an alternative to sugar/apple sauce. Though sucanat/rapadura and apple sound delish! Suzi, yes, I bet you could and you can also buy date sugar! Thanks for that even healthier tip! Hi! I only have dry black beans on hand. Do you know how much dry beans will be equal to 16oz cooked? I know there is quite a bit of expanding that happens. You’ll have to soak & cook your dried beans, but once they are cooked you’ll want two cups. So about 1 1/4 cups (give or take) dry. Completely unrelated- my daughter is on a (medically necessary) very high fiber diet and these brownies are WONDERFUL for sneaking in extra fiber. I add about 1/3 cup of whole wheat flour. Jessica, thank you for answering Sarah’s question, I didn’t quite know the answer for sure! I made these for a bible study last night, ALL the ladies in my group loved them! In fact I only have a few left. Thank you for sharing this recipe.